On early red-head-style external medicine and the Confucian physician Mukai Genshô. Almost every author dealing with the early introduction of Western medicine into Japan writes a few lines about the neo-Confucian physician Mukai Genshô (1609-1677) and a manuscript entitled Komôryû geka hiyô (“Secret compendium of red-head-style external medicine”) Mukai allegedly compiled while receiving instruction from a Dutch surgeon at the Dejima trading post in Nagasaki. Although the whereabouts and the contents of this manuscript, first mentioned by Shirai Kôtarô in 1908, were never revealed and later studies reported the discovery of further related manuscripts, Shirai's statements found their way into the famous “General catalogue of national books” (Kokusho sômokuroku) and other basic reference works. Based on Japanese and Dutch source materials, this study commences with the description of Mukai's life in Nagasaki and the events that led to his encounters with two European surgeons at Dejima in 1656 and 1657. Dissatisfied with the results of medical instructions given to him and his physician during the annual visits of the Dutch trading-post chiefs in Edo, one of the most prominent proponents of Western surgery, the imperial commissioner Inoue Masashige Chikugo-no-kami, requested a more detailed report on treatment methods and materia medica. The first report, signed in January 1657 by six Japanese interpreters, Hans Hancke and the trading-post chief Zacharias Wagener, was brought to Edo by the latter only to be lost in the catastrophic fire of March 1657 that destroyed vast parts of the city. A second version was presented at the end of the same year, based on copies kept in Nagasaki and further instructions by Hancke's successor Steven de la Tombe. As many 17th-century sources were transmitted through repeated copying, the original version drafted by Mukai Genshô has to be reconstructed through a comparison of all available sources. Repeated investigations eventually led to the rediscovery of Shirai's manuscript Komôryû geka hiyô, which turned out to be a rather corrupted source mixing texts of different provenance. Other sources such as Oranda geka ruihô (“Arranged formulas of Dutch external medicine”) or Shôji shinan (“Compass of Diagnosis and Treatment”) are much more coherent in their content, fitting well with statements in the diaries of the Dutch trading-post chiefs. As these sources show, Mukai studied the treatment of several wound types (especially stomach-cut wounds) and of “swellings” (ulcers, tumours, inflammations, etc.) and collected information on a variety of simple and composed medicaments. From the very beginning, he and the interpreters were well aware that the provision of herbs and medicaments would pose a great problem. Therefore, he and Hancke paid several visits to local pharmacies in Nagasaki looking for useful substitutes. The results of these activities have become known in the newly found manuscript Oranda geka ihô (“Medical formulas of Dutch external medicine”). The surgical teachings of Caspar Schamberger in 1650 were translated and compiled by Inomata Dembei, who was an excellent interpreter but lacking medical knowledge. Six years later, the highly trained physician Mukai received intensive instructions on Western medicine assisted by all interpreters from the trading post. Inomata's report was quite clear with respect to wound treatment methods, but when it came to “swellings” (shumotsu) he was only able to transliterate the Latin names in katakana syllables. Mukai had to satisfy the imperial commissioner Inoue with a more useful report. Based on the explanations given to him by the trading-post surgeon, he attached to each Western term a Chinese “equivalent” following the most comprehensive Eastern source on surgical matters, the Waìkē zhèngzōng (Jap. Geka seisô, “Orthodox manual of external medicine”)). He then summarized the basic traits of each “swelling” following the Chinese teachings and added a description of Western treatment methods and medicaments. Misunderstandings and misconceptions were inevitable, but this approach resulted in a well-structured text that seemingly needed no further explanation and could be used even by physicians who had no chance at all to communicate with Western colleagues. Copies of Mukai's report were soon circulated among interpreters and personal physicians of high-ranking persons. When Yamawaki Dôen published the first Japanese book on Dutch-style medicine, the Oranda geka ryôhô (“Good formulas of Dutch external medicine”) in 1670, he included many parts of Mukai's text and made this knowledge widely available. 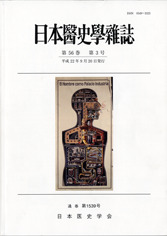 By combining Sino-Japanese pathology with Western treatment methods, Mukai had set an example that would dominate the reception of Western medicine in Japan for more than a century.